Norelco BG2040 is a multi purpose body groomer – It can be used as a shaver / a trimmer. Both have built-in length settings – The Multigroom 7000 features 18 built-in lenth settings While Norelco BG2040 features 5 length settings. Both are high performing body hair trimmers with rounded blades & combs to prevent scracthing your skin. Norelco BG2040 features a 3D Pivoting head which follows your body contours thus offer you with a clean & uniform close shave. Both body hair trimmers are easy to use and they charge very fast. The shaving head / attachment is made up of smooth foils which prevent cutting and nicking of your skin. WHAT TO LOOK FOR WHEN BUYING A BODY HAIR TRIMMER? Body-type of the trimmer: The body of different hair-trimmers can vary in size and shape but they are all designed to perfectly fit into your hands. In fact, smaller in size trimmers are mostly designed for straightening and tidying up facial and body-hairs because they enable the user to perform smaller and subtler movements without causing any damage to the skin while larger-trimmers are suitable for a wider-range of movements like when it comes to head-shaving. Handle-Design: you should consider getting a body-trimmer that fits perfectly in into the hands and with contours that allow for better grip in hands even when they are wet. In fact, body-trimmers with rubber-handles allow for better grip in the hands especially when shaving under wet-conditions. Blade-Type: The Blades on most body-trimmers are the same in their design and they actually tend to be smaller in-order to allow for smaller adjustments on facial-hair while clipper-blades tend to be bigger in-order to cover a larger surface-area. On the other hand, most trimmer-blades are made of stainless-steel because it’s durable and sharp while some advanced trimmer-blades are made out of ceramic which is less prone to wear and doesn’t conduct heat like stainless-steel blades. However, ceramic-blades tend to break more frequently than stainless-steel blades. Power-Button: you should get a hair-trimmer with a power-button that helps to turn it on and off or even start and stop the blades. So, try to avoid body-trimmers that start immediately after being into the main power-supply and require unplugging tube turned-off. On the other hand, most body-trimmers have their power-buttons placed on the side of the body in order to allow for easy access and control when trimming body-hairs. Guide-Combs: Get a body-trimmer with multiple guide-combs because these combs are used as a means of ensuring that clippers only shave-off a particular measurement of hair. In fact, guide-combs come in a variety of measurements and are designed for easy attachment and detachment from the trimmer. Power-Cord length for corded-trimmers: if you’re getting a corded body-trimmer, then make sure that you get one with a long-enough power-cord so that is doesn’t get into your way while trimming hairs. In fact, the main-leads/power-cords are normally situated at the bottom of the trimmer’s body and come in a variety of lengths so that you can a length that makes you feel comfortable when shaving. Battery-Strength for cordless trimmers: if you decide to get a cordless-trimmer, make sure that it has a stronger lithium-ion battery that can last for about an hour when shaving cordlessly. In fact, cordless body-trimmers are best suited for portable-use and will work perfectly for travelers. If you have been looking for a 2-in-1 body trimmer and shaver then you should consider getting the Philips Norelco Bodygroom 7100 since it’s an all-in-one men’s grooming system makes the shaving and trimming process quick and easy. This body-trimmer and shaver is suitable for use anywhere on your body form the chest, abs, back, shoulders to your head and it can even be used under wet and dry conditions in-order to facilitate for convenient usage. The Philips Norelco Bodygroom 7100 actually features a dual-end design whereby at the top it features a unique 3-D pivoting-head that closely follows all your body-contours in-order to provide you with a skin-friendly shave while the bottom-section features a high-performance trimmer with advanced cutting capabilities that provide refined grooming. Additionally, this trimmer features rounded blades and combs that prevent skin-irritations and guide-comb features 5 length-settings that range from 1/8 inch to 11/25 inches in-order to enable you get a look you want with less hassle and without using multiple-attachments. On the other hand, the Philips Norelco Bodygroom 7100 features an ergonomic-design coupled with soft-rubber side-panels and buttons that provide a secure and comfortable grip in both wet and dry conditions while the self-sharpening blades protect the skin and never require maintenance or lubrication. The Bodygroom 7100 is a cordless trimmer/shaver that will provide you with up-to 50-minutes of cordless-use after a 1-hour charge and even comes with a foldable charging-stand that can also be used for storage purposes. An All-in-one men’s grooming system makes shaving and trimming body-hairs quick and easy. A 3D pivoting-head that closely follows everybody-contours for a great-shave. Rounded blades and combs that prevent skin-irritations. You be able to get the look you want by selecting from the 5 length-settings on the built-in trimming-comb. It features a Water-resistant casing and materials in-order to facilitate for wet & dry shaving. The Dual-sided design enables you to use the Bodygroom 7100 as a trimmer and shaver at the same time. The built-in trimming-comb comfortably glides over the skin & trims even the thickest hair. The Shaving-head prevents nicks and cuts while capturing long and short hairs in just a single stroke. The included charging-stand makes the Bodygroom 7100 very convenient to use and store. The soft rubber side panels and buttons provide a secure and comfortable grip in both wet & dry conditions. The shaving-head hypo-allergenic & self-sharpening blades that require no maintenance & lubrication. It’s a cordless, rechargeable body trimmer & shaver that provides up to 50-minutes of shaving after a 1-hour charge. The Bodygroom Series-7100 is a bit expensive when compared with other body-trimmers on the market. Philips Norelco MultiGroom 7100 was designed to help you groom your beard, mustache, head, nose and other body-parts because it features an all-in-one design. The Philips Norelco MultiGroom 7100 trimmer is equipped with self-sharpening blades made from finely ground steel in-order to ensure long-lasting performance while the rounded blade-tips and combs prevent skin-irritations. In fact, the Multigroom-7100 features a full-size metal-trimmer with an adjustable-comb that can be adjusted from 1-18mm in order to achieve an even beard while the precision-trimmer attachment helps to create fine lines and details. On top of that, the included Bodygroom-shaver facilitates for a gentle and comfortable shave on the face and neck in just one stroke. In fact, this shaving-head is made of patented rounded-tips to protect your sensitive skin while the integrated nose-trimmer helps to remove unwanted nose and ear hair easily and comfortably. On the other hand, the included hair-comb will help to keep your haircut in style or even help you create a new hairstyle by trimming different lengths ranging from 3mm-to-20mm in precise increments on 1mm between each setting while the body-trimming comb offers you up to 10 different settings in order to allow you trim body-hairs at a preferred exact length. likewise, the Philips Norelco MultiGroom 7100 features a Turbo-boost function that helps allows it to cut the longest and most dense parts of hair by simply increasing the cutting-speed while the integrated lithium-ion battery provides you with over 60-minutes of cordless-shaving after a 1-hour charge. Lastly, the Philips Norelco MultiGroom 7100 is fully-washable and can be quickly and easily cleaned under tap-water. It’s an all–in-one trimmer designed to trim all hairs on your body quickly and comfortably. Self-sharpening blades made of finely-ground steel to ensure long-lasting performance. It features skin-friendly rounded blade tips and combs in order to prevent skin-irritation. 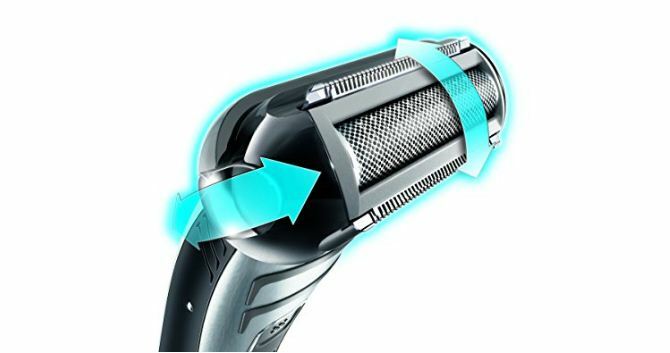 The integrated turbo-boost feature delivers fast trimming results even on thicker body-hairs. An inbuilt lithium-ion battery that provides 60-minutes of cordless-usage after a 1-hour charge. It’s fully washable and can be easily cleaned under running tap-water. It’s a wet & dry shaver that can be used in the shower for a comfortable shave or dry for optimum convenience. The included metal-comb offers 18 adjustable length-settings so that you can always achieve a desired beard-length. The precision-trimmer helps to create fine-lines and details along your beards and mustache. The included nose-trimmer helps to remove unwanted nose and ear hair comfortably and easily. The Bodygroom shaver facilitates for a gentle and comfortable shave over the face and neck. The included hair-comb helps to keep your haircut in style and even allows you to create a new hairstyle. The included body-trimming comb offers 10-settings to help you trim your body at an exact length you prefer. Its shaving head are a bit hard to clean especially if they get clogged with dirt. Some plastic-attachments are poorly design and made of plastic-material. Some people claim that the trimmer offers inconsistent cutting-lengths. The MANGROOMER Ultimate Pro is a Back-Shaver with a unique patented design that will enable you to reach all areas of your back easily in-order to shave-off all your back-hair effortlessly. This back-hair trimmer even features a power-bust button that allows it to shave through extra-thick and coarse hair 2 interchangeable attachment shaving-heads which include the 1.8 inch ultra wide back groomer that helps it to shave large-areas and longer-hairs quickly and the foil body groomer bi-directional head for regular maintenance of shorter-hairs in-order to help you achieve a perfectly smooth shave. Additionally, the Shock Absorber Multi-Functional Flex-Necks on both Attachment-heads effortlessly follow the contours on your back in-order to ensure perfect blade-to-skin contact at any angle resulting into an ultimate shave with optimum comfort and closeness. 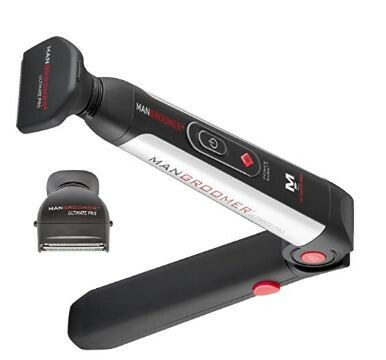 On the other hand, the MANGROOMER Ultimate Pro features an extreme-reach, extendable and ergonomic rubberized handle that locks into place at any length you choose by simply pressing the PRO-XL Extension Lock-Button while the new Power-Hinge Easy Push Lock-Button allows for locking the ULTIMATE-PRO Back Shaver at any angle you want. 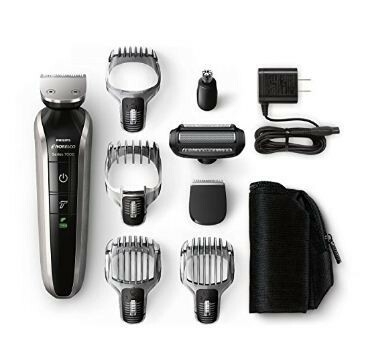 Lastly, the MANGROOMER Ultimate Pro back-hair trimmer features an advanced quick-charge battery that allows for easy and fast recharging while integrated LED-light indicator helps to alert the user when the back-shaver needs to be charged, when it’s charging and when it’s fully-charged. A Power-Burst button that offers extra-power to easily trim through extra thick back-hair. The Pro XL extension lock-button locks the back shaver at any length selected. The Patented 135° Opening enables you to reach all areas of you back. 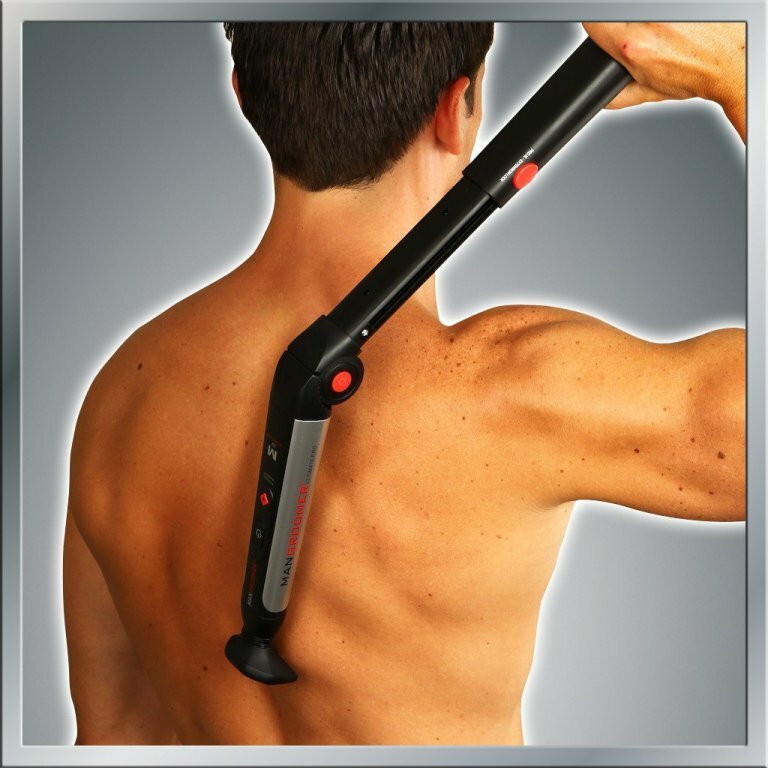 A Fully extendable and adjustable handle allows you to shave even the hard-to-reach areas of your back. The 1.8-inch Ultra Wide Back-Groomer Blade attachment helps to shave large-areas & longer-hairs quickly. The Foil Body-Groomer Bi-Directional Head attachment allows for regular maintenance of shorter-hairs in the back. The Shock Absorber Multi-Functional Flex Neck on both of the Attachment Heads allows for effortless following of contours on your back. The Shock Absorber Multi-Functional Flex Neck also allows for perfect blade-to-skin contact at any angle. The attachment-heads feature Ultra-Sensitive, Hypoallergenic Blades made from Stainless-Steel in-order to provide you with a comfortable & non-irritating shave. The Ergonomic Rubberized handle ensures optimum grip and maximum-control while shaving. The advanced Quick Charge Battery allows for cordless use and fast re-charging. The integrated LED-light alerts you when the back-shaver need to-be charged and when it’s charging or fully-charged. It’s a bit long and bulky whereby this makes it inconvenient to carry when travelling. It’s designed for back-hair trimming and shaving only and you won’t be able to use it to shave other body-parts. The BaKblade 1.0 is a simple back-hair remover and body shaver equipped with an easy to use extra-long handle in-order to provide you with smooth and close shave. in fact, the BaKblade 1.0 uses wet and dry disposable razor-blades that have been specifically designed and engineered to shave your back & body and can be refilled at any time while its extra-long handle enables you gain access to all those hard-to-reach areas while applying some pressure in-order to achieve a close shave. Additionally, the blades used by the BaKblade 1.0 will not rust or dull like other blade-brands and the integrated safety-guard will help to prevent cuts and razor-burn while shaving your back and other body parts. All in all, the BaKblade 1.0 DIY Back-Shaver was made to make the hair-removal process quick, easy, pain-free and affordable. The BaKblade shaver is easy to use and does not require batteries. An extra-long handle that allows you to access all hard-to-reach areas of your body. Specially designed and engineered blades to shave your back & body smoothly and closely. The patented BaKblade blades can be used under wet or dry conditions. These unique razor-blades will not rust or dull like other razor-blade brands. Its Patent-approved DryGlide safety-blade technology provides the smoothest and quickest shave. The Replacement-Blades are super affordable and this makes the BaKblade shaver a better choice than expensive hair-removal treatments. It provides an easy and pain-free shave in both wet and dry conditions. It’s a manual body-shaver and this implies that you will need to apply enough pressure to achieve a close shave. It’s only compatible with 1.0 replacement blades and this makes it a bit inconvenient to use. Regular blade-replacements may seem expensive to people used to electric body-shavers. SHAVING-TIME 60-mins after a 1-hr charge. 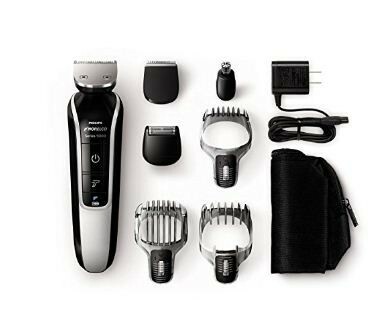 The Philips Norelco MultiGroom 5100 is an all-in-one face and head Grooming Kit designed to help you groom your facial-hair and head-hair at any time. 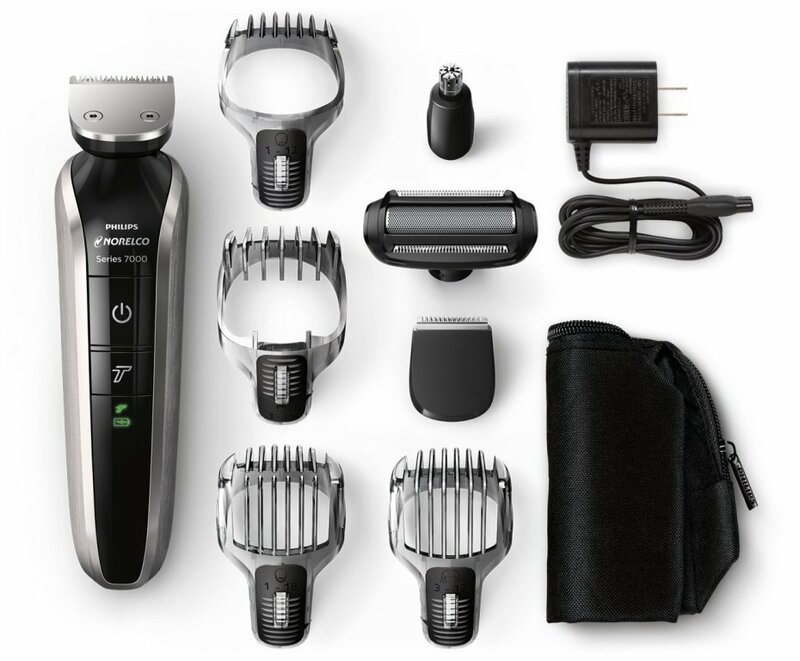 This trimmer comes with 7 unique attachments that allow you to get the looks you want on your face and head while the 18 build-in length settings help you trim that exact style you want at a given level. Additionally, the Philips Norelco MultiGroom 5100 trimmer features self-sharpening blades made out of finely-ground steel in-order to ensure long-lasting performance while the rounded blade-tips and comb-tips ensure a skin-friendly shave with minimized skin-irritations. On the other hand, this trimmer also features an exclusive turbo-boost feature that delivers fast results even on the thickest facial-hairs while the integrated lithium-ion battery provides the user with up to 60-minutes of cordless-shaving after a 1-hour charge. Additionally, the Philips Norelco MultiGroom 5100 is a wet and dry hair-trimmer that can be used for trimming body-hairs in either wet-conditions for comfortable results or dry-conditions for optimum convenience especially when in a hurry. On top of that, this hair-trimmer and all its attachments are fully-washable under running tap-water thus ensuring quick and easy maintenance at all-times. It comes with 7-unique attachments that will enable you to achieve a desired facial-look. It’s equipped with self-sharpening blades made of finely-ground steel in order to ensure long-lasting performance. The rounded blade-tips and comb-tips help to prevent skin-irritation by ensuring optimum shaving-comfort. 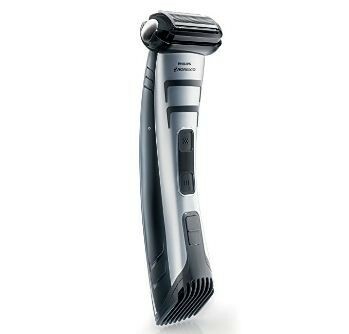 The Turbo-Boost feature facilitates for fast shaving-results even on the thickest facial-hair. The strong, inbuilt lithium-ion battery provides up to 60-mins of cordless-shaving after a 1-hour charge. The comb-attachment features 18 adjustable-settings that enable you to trim the beard at desired length. The Precision-trimmer helps to create fines-line and details. The Nose-trimmer helps to remove unwanted nose & ear hair easily and more comfortably. It’s fully-washable and can be easily cleaned under running tap-water. This trimmer also comes with a cleaning-brush that ensures thorough cleaning of heads. The detail-foil shaver helps to remove unwanted facial-hair on the cheeks & chin. The hair-comb helps to keep your haircut in style & even enables you to create a new haircut. The stubble-comb enables you to trim beards at an exact length by simply selecting from the 12 length-settings. Some people complained about the terrible blade-adjustments which tend to provide uneven hair-trimming lengths. It comes with a lot of attachments which may be hard-to-use since they may confuse users. It’s only designed for facial and head hair trimming and this implies that you be able to use it to shave other parts of the body like your back. In conclusion, all the hair-trimmer features in this post are of great quality and ensure high-performance when it comes to trimming body-hair. So, you should consider choosing from any of these hair-trimmers in-order to achieve a more efficient, effective and comfortable shave while at home or when travelling.